Looking for print designs for your business? 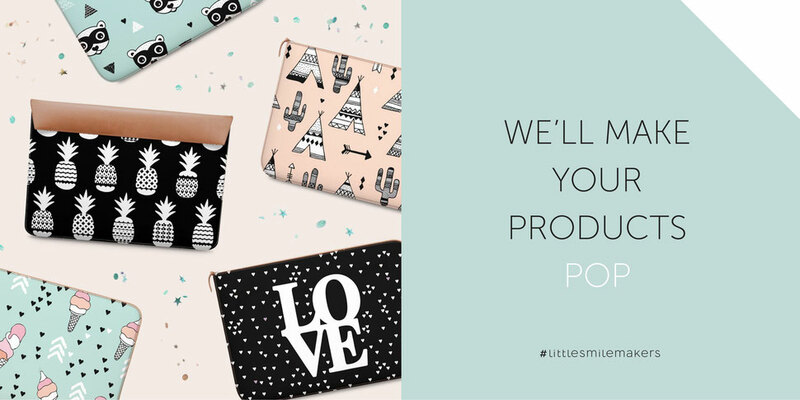 Little Smilemakers Studio specializes in creating fun and joyful print designs, mainly focussing on fashion and home decor. For 7 years we've been licensing designs in over 30 countries worldwide. We offer no-nonsense design guidance and assist you in building a consistent visual language for your customers by creating strong signature and on trend designs. Your product deserves beautiful designs. Maxomorra is a children’s clothing brand based in Sweden since 2008. Their clothes are characterized by functional design with playful colors and patterns. For the new Plus Collection we have made a fun, on trend mix of hand drawn illustrated patterns for their clothing line. The company is commited to using ecologically and socially responsible resources, so your little one's skin is protected. We share this eco-conscious mindset with them, and love supporting companies that go all the way for their tiny customers. Contact us for more info about surface pattern designs for your company. Are you looking for Little Smilemakers fabric? We've expanded our online shop to over 6000 designs in the past seven years. Each month we upload new designs and colors. We're excited to see how Spoonflower has matured with us. Producing fabric is delicate business and we appreciate the great effort put into their services. We're very happy to collaborate with such a wonderful company where designers get a platform to share their art and customers can get beautiful designs choosing from the best sourced cotton. Contact us for more info about licensing our Non-Exclusive Spoonflower designs. Bambino Mio is a UK based company focusing on reusable diapers, potty training pants, swimwear and nursery textiles. Selecting print designs always was a secondary element within their product development. After years of licensing designs from different artists, the company decided it was time their printed products would carry a unified design signature. We recently developed a visual brand identity for their print designs resulting in a steady coherent signature look. We're now in the process of implementing these guidelines. Contact us for more info about signature development and trend research.